February 2016 61 compatible colors that match perfectly with the building colors. The sidewalk features a 'malt 2' border with a slightly darker 'malt 2/buff' infill. In contrast, the 'tan/sienna' blend for the street border is slightly darker. The drive to the Commons Building uses an octagon/square infill pattern, with the octagons in 'malt 2/buff', and the squares in 'tan/sienna' hues. To be similar, yet different, the drive into the building's parking garage and on-grade parking used a uni-décor shaped paver infill that was 60% 'malt 2/ buff' with 40% 'tan/sienna'. The entry drop-off into the South Tower went back to the octagon/square pattern. All curbs and gutters were concrete in a 'tan/sienna' to blend with the pavers. To fit the design seamlessly into the site, the landscape architect allowed the perimeter of the site to remain at the existing +6' elevation. 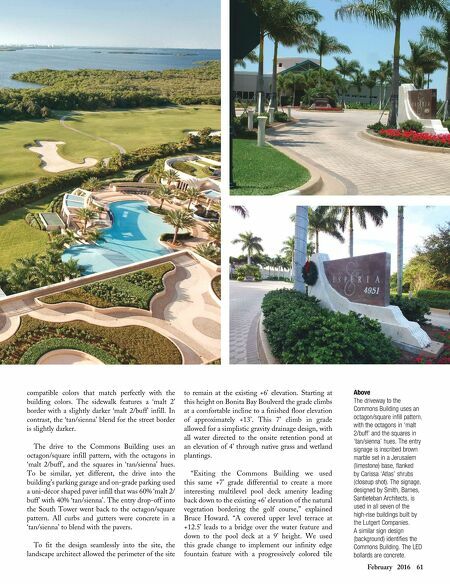 Starting at this height on Bonita Bay Boulverd the grade climbs at a comfortable incline to a finished floor elevation of approximately +13'. This 7' climb in grade allowed for a simplistic gravity drainage design, with all water directed to the onsite retention pond at an elevation of 4' through native grass and wetland plantings. 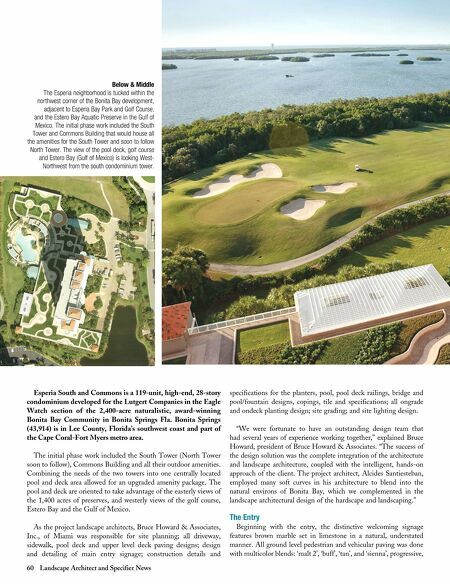 "Exiting the Commons Building we used this same +7' grade differential to create a more interesting multilevel pool deck amenity leading back down to the existing +6' elevation of the natural vegetation bordering the golf course," explained Bruce Howard. "A covered upper level terrace at +12.5' leads to a bridge over the water feature and down to the pool deck at a 9' height. We used this grade change to implement our infinity edge fountain feature with a progressively colored tile Above The driveway to the Commons Building uses an octagon/square infill pattern, with the octagons in 'malt 2/buff' and the squares in 'tan/sienna' hues. The entry signage is inscribed brown marble set in a Jerusalem (limestone) base, flanked by Carissa 'Atlas' shrubs (closeup shot). The signage, designed by Smith, Barnes, Santieteban Architects, is used in all seven of the high-rise buildings built by the Lutgert Companies. A similar sign design (background) identifies the Commons Building. The LED bollards are concrete.